I’ve always been a fan of dystopian films with classics like Blade Runner, Red Dawn, 12 Monkeys, Escape From New York, The Road Warrior and Children of Men topping my list of favorites. I’ve enjoyed many other examples of the genre over the years, but when Martyn Burke’s The Last Chase fell on to my cinematic radar recently, my faint memories of this 1981 film may have pre-qualified it for the “guilty pleasure” category. I’d been a fan of Lee Majors since The Six Million Dollar Man aired on TV in the 70’s, and I remember enjoying The Last Chase enough to watch it repeatedly back when it was in heavy rotation on cable TV, but I knew going into this latest screening that my memory of the film may not live up to the reality of how it would hold up 35 years later. So I went into The Last Chase for a fun ride and a little nostalgia but surprisingly, despite the film’s age and several dated elements, I found the film very engaging today. The film begins with a Porsche race car pulling up to a racetrack, out of gas. Former racer Frank Hart (Lee Majors) tries to fill up his car, but the pumps are locked. The track is abandoned save for Fetch, an old track employee, who tells Hart there’s no more gas to be had and other basic supplies are starting to run low. Hart breaks open the pump, siphons out what little gas he can get for his station wagon and tows his racer home, the only driver on the empty highway. All cars have been made illegal and had to be turned into the government a week earlier. But Hart is in no hurry to obey any orders. Adding to Santana’s frustrations, her department’s computer system is hacked by prep school student Ring (played by Chris Makepeace). Ring is also an outsider that has trouble conforming to the social hierarchy of his school. He is ostracized and bullied by his fellow students but gets even by using his expertise in chemistry to set off homemade explosives on campus. When he’s not causing mayhem on campus, he sneaks away to a computer he has hidden in the attic of his dorm to hack into the government grid. Back home, as Hart replays the video of his racing accident just to see a clip of his late wife, a broadcast from Radio Free California (an independent “free” territory) breaks into the TV feed, telling citizens that the residents of California have “returned to the land” and to their machines to escape from the oppressive regime that now controls America. This inspires Hart to break out the race car that’s been buried in pieces under his garage, working at the transportation authority by day and assembling it at night with one week to go before his trial. Fed up with the propaganda he’s been forced to feed young audiences (“like a reformed sinner preaching to the congregation”) and the system that put him there, Hart turns tide during a speech to a group of prep school students and extols the virtues of cars, freedom and private ownership. His impromptu speech catches the attention of Ring, who sends Hart a direct message to his home that he is not alone. Hart is subsequently suspended from his position at the transportation authority with jail time very likely for his offense. That night, as Hart looks over an old road atlas in his home, he catches Ring breaking in. When the police show up moments later, Hart assumes it’s to arrest him for his imminent trial, but they’re actually trying to track down the runaway Ring, who’s third attempt at hacking Santana’s department computer was traced back to his boarding school. Hart covers for Ring and the police leave, but he makes a critical error when he benignly tells the officers he was waiting for his family to come home. When Santana reviews the police report moments later, she catches this irregularity and orders the police back to Hart’s home to arrest him. With the police pounding on his door, Hart fires up the racer to hit the road to Free California, but Ring jammed the garage door opener to strong arm Hart into taking him along. Desperate to get out before the police can stop him, Hart agrees to let Ring join him on the escape. The police set up a barricade blocking Hart’s route on the outskirts of Boston, but he outflanks them by taking a long unused hidden tunnel out of the city and the police golf carts can’t catch him. Word of Hart’s escape in an illegal race car quickly reaches Washington, and Hawkins (played by George Touliatos) is dispatched to oversee how Santana’s bureau handles his capture. Calm and collected with an eerie confidence, Hawkins draws on his old school experience and quickly begins calling the shots over the unprepared Santana. She naively believes that they will easily capture Hart once the car runs out of gas. But Hawkins politely explains that the car will not run out of gas because all old gas stations have underground tanks in which there are two to three inches of gasoline the internal pumps could not reach. With a special pump (which was established in the opening scene of the film) Hart would be able to siphon enough gas for the 3000 mile race to California. Hawkins tasks Santana’s assistant Morely (played by Ben Gordon) with tracking down former Korean and Vietnam War jet pilot J.G. Williams to convince him to fly again in an attempt at neutralizing Hart. Morely finds Williams (played by Burgess Meredith) in a modest apartment divorced, depressed and drinking. A former highly decorated Air Force pilot still stinging from the abuse he received upon his return from Vietnam, Williams’ skepticism is heightened with the words “Your government needs you.” But Morely’s offer to have him fly a jet fighter again makes him put down his whiskey bottle and return to active duty for the first time in over forty years. After restoring an old F-86 jet fighter, Williams takes to the skies and the chase is on. No spoilers here. I revisited The Last Chase as a result of the faint memory of watching it several times on cable TV around 1982-1983. There was nothing specific to the film or its message that drew me to it recently, just simple curiosity. The film’s message of “eco-totalitarianism” and the loss of individual freedom was lost on me back then, it was simply a chase film to me. While some might judge the film today as ham-fisted propaganda (its message would resonate loudly today with a Libertarian audience), as a dystopian film it works to solid effect. The computers were crude by today’s standards, but they were used to good enough effect in the film because the idea behind what they were capable of (local police camera surveillance, satellite surveillance) are more believable today vs. 1981 because of the extent to which we now have surveillance technology in use. Ironically, even with the dated representation of Santana’s surveillance system, today’s audience would be more accepting of this story element. Lee Majors vs. Burgess Meredith. Race car vs. jet fighter. Liberty vs. totalitarianism. I’m glad I rediscovered The Last Chase. The film’s opening scenes are a little clunky, especially with the unnecessary voice over, and there are a couple of scenes where a fair amount of suspension of disbelief is necessary. But 35 years later I still enjoyed the film and have a greater appreciation for the story and the cast (Diane D’Aquila and George Touliatos are particularly good). It’s easy to unfairly judge the film on some of the more dated elements, but overall The Last Chase is a fun ride. Did you ever flip through the channels and stumble on a movie that just makes your night? Monday November 18th brought about an unexpected surprise when Turner Classic Movies played Bill Forsyth’s coming of age classic Gregory’s Girl in the 8PM timeslot (which is absolutely deserved – the film, produced in Scotland, ranks # 30 on the British Film Institutes list of the top 100 British films, and a clip from the film was included in the opening ceremony video of the London 2012 Olympics). Gregory’s Girl has a special place in my cinematic heart and I remember watching (repeatedly) when when it premiered on cable TV around 1983. We didn’t have a VCR at that time, so it must have been on the schedule at least 20 times over the course of one month. I lost count of how many times I’d seen it back then. High school student Gregory (played by John Gordon Sinclair) has his complacent life as a high school student and soccer player upended when Dorothy (Dee Hepburn) earns a spot on the boys soccer team. He’s immediately smitten with her, and doesn’t even mind that she’s taken over his position at center forward and he’s been moved to goalie (at the expense of his best friend Alan losing his place on the team). He polishes the ball before handing it to her instead of kicking it to her during the games and practice, and feels the pangs of jealousy (and a little left out from the other side of the pitch) when their teammates and the opposing team each kiss her after she scores her first goal. His attraction to her reaches a fever pitch but he can’t muster the courage to ask her on a date. At first Gregory’s cavalier attitude on life is charming and brings the audience back to their carefree teenage days (he calls his father “Mike,” arrives at school as he pleases, isn’t phased by losing a soccer game and doesn’t take his soccer coach seriously when told he may be kicked off the team), but it makes you wonder how he’ll take on life as he gets older if he simply lives his life as “just happy to be there.” Despite the toll his unrequited love takes on Gregory emotionally, it’s what he needs to begin taking stock of himself and breaking the mold of complacency. His ten year old sister Madeline is his voice of reason (“If you don’t pay attention to yourself, how do you expect people to pay attention to you?”) as well as his stylist when he finally musters the courage to ask Dorothy on a date. The tag line of the film says it best: “There’s a little of bit him in all of us.” Forsyth allows the audience to feel Gregory’s ups and downs with all of the angst in between. But what I appreciate the most about Gregory’s Girl is how it doesn’t over dramatize Gregory’s situation or the every day lives of him and his friends. The opening scene may give the mistaken impression that the film will take a sophomoric approach a la Porky’s, but there are no pacts to lose their virginity, no plans for revenge on their teachers, or pranks that will make them legends. Forsyth didn’t need to go down that road. He’s crafted a beloved story and film that only needs to be about a young man trying to get a date with the girl that has his heart. Compared to American teen films of the 80’s like The Breakfast Club (a great movie in its own right), Gregory’s Girl keeps it simple, and this simplicity keeps the characters and plot grounded in a way that each of us can pick a character and substitute ourselves. Gregory’s Girl succeeds as a film because we can relate to the themes of the awkward teen years, unrequited love, etc. and cheer Gregory on. Forsyth’s style of directing is understated and charming, and he is a master at making a subtle gesture pop out of nowhere and turning it into a funny moment (see his 1983 classic film Local Hero). Several of the scenes that bring out the personalities and idiosyncrasies of the supporting characters may leave the audience guessing as to Forsyth’s motivations for including them, but each of these scenes adds a new layer to the film by showing us what Gregory has around him and how he is shaped by his friends and surroundings. As I began this post, I was happy to see that Gregory’s Girl is available on Netflix, and Hulu is streaming the complete film for free! In a first for Fante’s Inferno, it’s my honor to present (via Hulu), Bill Forsyth’s classic film Gregory’s Girl in its entirety. Anyone who knows me knows that Terry Gilliam is one of my favorite directors, with several of his films on my list of all time favorites, particularly Monty Python and the Holy Grail (co-directed with Terry Jones), The Fisher King and of course Brazil. 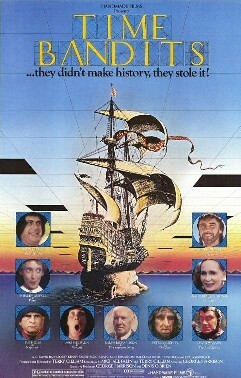 But another one of my personal favorites is his 1981 fantasy film Time Bandits. By 1981 my brother and I had watched every episode of Monty Python’s Flying Circus and were familiar with Gilliam’s animation on the show, but Time Bandits was my first introduction to Gilliam as a feature filmmaker (it would be several years before I would see Monty Python and the Holy Grail and Jabberwocky for the first time). We caught Time Bandits at our local movie theater a week or two after it was released, and I don’t think there were more than 15 or 20 other people in the audience that Saturday afternoon. I didn’t know too much about the plot going into that first screening, but at the time I was under the mistaken impression that it was a Monty Python film. I was confused as to why John Cleese and Michael Palin only had minor roles, and a little disappointed that the other Pythons weren’t in the film, but that thought quickly disappeared as the story progressed. By the closing credits I wanted to stay in my seat and watch it again. Terry Gilliam wastes no time getting the story going. Ten year old Kevin (played by Craig Warnock) is woken up in the middle of the night when a knight on horseback charges out of his closet and into a forest that only a moment earlier was his bedroom wall. Cut to the next night: he dozes off waiting for the knight to return, but instead of the charging knight he’s woken up by a group of little men sneaking out of his closet. Before Kevin can figure out what’s going on, the band of thieves is discovered and chased by an ominous figure, ordering them to return “the map.” With Kevin’s help, they push through the bedroom wall into a tunnel leading to a black abyss. Barely ten minutes into Time Bandits, the adventure is in full swing. The under-sized Time Bandits (Randall, Wally, Fidgit, Strutter, Og and Vermin), international criminals by their own definition, have stolen a map of “time holes” that allow them to travel to different eras in history. According to their leader Randall (played by David Rappaport), they were employed by the Supreme Being to repair the time holes but realized they could have a more lucrative career as time traveling thieves. I loved every minute of Time Bandits when I was nine, and continued to enjoy it with every subsequent screening over the years. One of the protagonists may be a ten year old, but it’s more than a kid’s film. Gilliam and Palin’s script had wit that adults could appreciate. They packed a lot into the story, and it’s an amazing ride for both kids and adults as the gang of thieves take Kevin on a time traveling journey that includes the Napoleonic era, the Middle Ages and ancient Greece. But each step of the way they’re chased through time by both the Supreme Being (in a cameo by Sir Ralph Richardson), and his nemesis the Evil Genius (played by David Warner). Every set, costume and camera angle in Time Bandits has Gilliam’s touch of the fantastic. The effects are low tech by today’s standards, but that adds to the charm of this film. The cast is as strong as any in Gilliam’s films, highlighted by Ian Holm (Napoleon) and Katherine Helmond (Mrs. Ogre), two favorites of Gilliam that would have significant roles several years later in his critically acclaimed Brazil. But David Warner, Ralph Richardson and Sean Connery (King Agamemnon) take it to a higher level. The cast is clearly shown on the movie poster, but each introduction of their characters leads to unexpected turn in the story. This could easily have been a kid’s movie, but the film’s humor and cast of incredible actors (that didn’t take the story for granted) elevate Time Bandits to a fantasy film that’s still fun to watch over thirty years later. Marvel Comics’ What If? was a title I enjoyed in the 80’s. The series, with stories introduced by The Watcher, placed our favorite Marvel characters in one-off stories that diverged from their established continuity to show how their destinies would have been altered as a result of one decision or twist of fate. The first volume of the series for 47 issues from 1977 to 1984 and began with What If Spider-Man Joined the Fantastic Four? (February 1977). Over the course of the first run the series provided some great stories. Two of my favorites were What If Wolverine Killed the Hulk? and What If Phoenix Had Not Died? I reached into the old box o’comics this past weekend and found issue #28: What if Daredevil Became an Agent of S.H.I.E.L.D.? (August 1981). This issue contained two other stories (one of which was What If Ghost Rider Was Separated from Johnny Blaze?) but the main story was an 11 pager by written by Mike Barr with pencils and inks by the amazing team of Frank Miller and Klaus Janson. On the Heli-Carrier it’s discovered that Murdock’s exposure to the radioactive material has blinded him permanently. But his other four senses have heightened, and Col. Nick Fury sees this as an opportunity to train Murdock to be the best agent S.H.I.E.L.D. has ever had. Back in New York’s Hell’s Kitchen Matt’s father, boxer Battlin’ Jack Murdock, is kidnapped by Hydra. After a month of training under Fury, Matt is ready to head home. Fury tries to keep him with S.H.I.E.L.D., but Matt tries to make a break for it when he realizes his father is held captive. No spoilers here. This was a great story (co-plotted by Barr and Miller) that packs a lot into its 11 pages. When What If #28 hit the stands, Miller and Janson were already two years into their classic run on Daredevil. What If Daredevil Became an Agent of S.H.I.E.L.D.? could have easily been cranked out as a simple backup story, but Barr’s words and Miller and Janson’s artwork fire on all cylinders. I think Miller and Janson’s layouts are a great example of the differences between comic book storytelling 30 years ago vs. today. You could take the word balloons off of each panel and still follow the story by the art alone, unlike a lot of contemporary comic stories that seem to have most of a page consist of “talking head” panels and a limited amount of action. I prefer the old Marvel Method over full script for this reason. Tagged 1981, Bronze Age, comic books, Daredevil, Frank Miller, Hydra, Iron Man, Klaus Janson, Marvel Comics, Mike Barr, Nick Fury, S.H.I.E.L.D., The Watcher, What If?